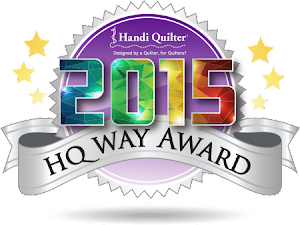 Voting is up for the last entry for this season's Project Quilting challenges! This is my Sugary Sweet Baby Quilt. The challenge involved using a large print fabric, and at least one stripe or plaid fabric. I chose to use large prints in several ways. 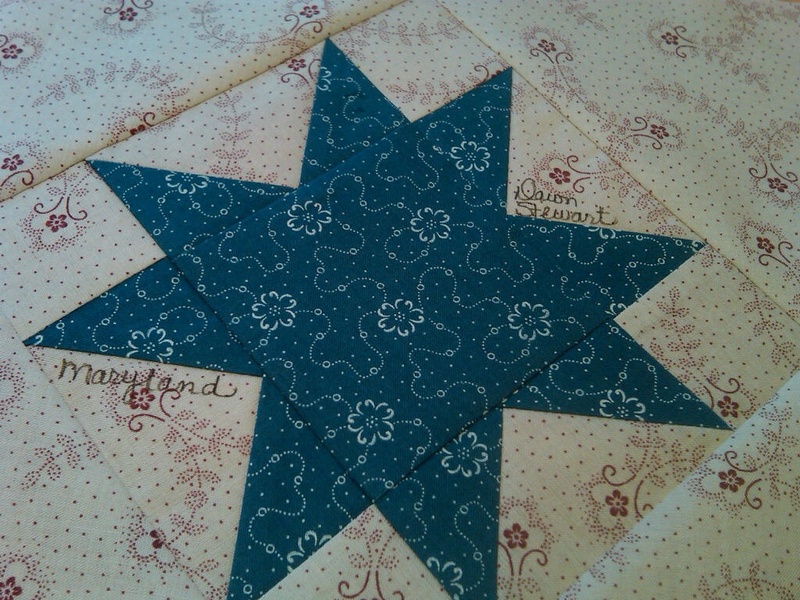 First I used the big focus print as a large section of the quilt, just a little off centered. I also cut a larger print up to make the narrow pink sashing strips; and the bright yellow binding is also a large print. The striped fabric I used as accent sashing strips on either side of the large print. 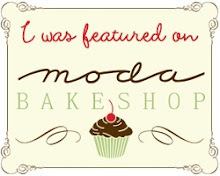 Go on over to Kim's blog to check out all of the other Large Print entries and to vote. Leave a comment to be in the running for a cute little fabric bear for the giveaway! Sign your name, add your state, and mail it out before the May 1st deadline. 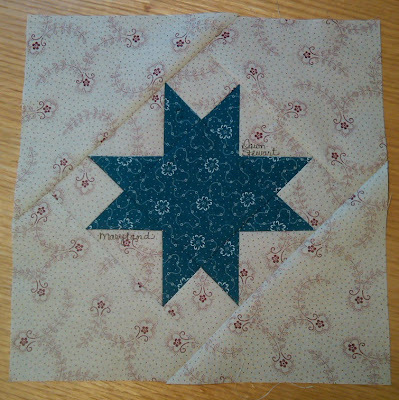 The goal is to have the quilts finished by Flag Day on June 14th ~ I thought that was a cool touch :) A bunch of ladies on my Quiltsy Team on Etsy are making blocks, do you have a group or guild that can participate? 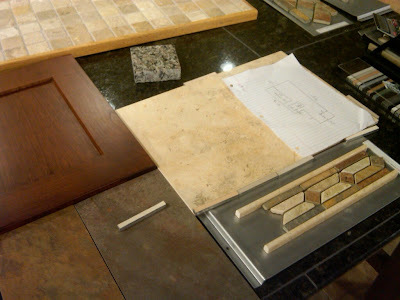 Yesterday we started the process of picking out the tile for the remodel of our master bathroom that has been planned for some time now. We're just now getting around to it because after our kitchen remodel last year, I was so tired of making choices and decisions that I just had to take some time off. 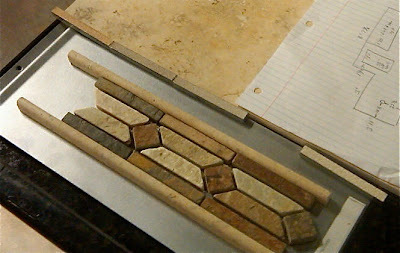 Now we were ready to go again and my heart was not really in it, until while standing there in the tile shop for the hours that it took us to make all of our choices, it struck me how much this was like picking out fabrics for a quilt. Aren't these just yummy! 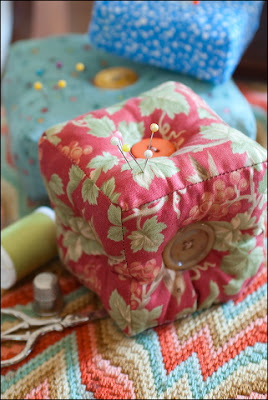 They are easy-peasy to make, and a great way to use up extra fabric from other projects or left over charm squares ~ and because sometimes you just need a simple weekend project...just for fun! The ones shown above were made by my daughter Lisa! And they were photographed for this new magazine publication ~ have you seen it yet? 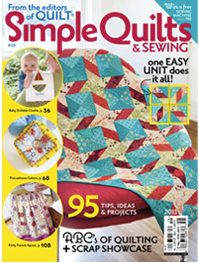 It comes from the editors of Quilt Magazine and it's chocked full of fun projects and ideas for quick quilting and sewing (and great ideas for using scraps). It's a special issue that can be found on the news stands now. So after playing catch up at the end of last week, and then having to take a quick unplanned trip to Virginia on Saturday to help out with my grandbabies while both of their parents recover from an impromptu bout of food poisoning (yes, they were both really sick at the same time), I'm now back and finally getting to go through my little bunch of goodies from the Lancaster quilt show. I didn't take a bunch of show quilt pictures at this show, because I was just wandering and wasn't taking the time to watch signs as to which quilts I was allowed to photograph and which ones not (I just have to be in the mood to deal with all that sometimes, sorry), But here is a picture of a panel that I purchased from the Mary Koval Baltimore Album reproduction fabric from Windham...kind of like a quilt. 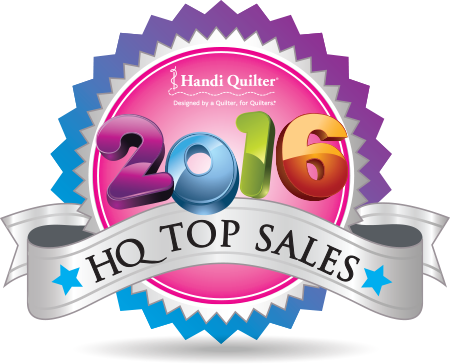 More quilt show fun this weekend with the Southern Comforter's Guild Show happening Saturday and Sunday, March 26 & 27th! Don't you just love the sights and sounds of a quilt show? Last weekend I visited the Baltimore Heritage Quilters Guild show called Quilt Expo 2011 held at Goucher College in Baltimore MD. And sometimes I run into my friends! This striking Dear Jane was made by my friend Rita Clark. This Dear Jane beauty was made by my friend Dawn Burckett of The Straw Needle blog. 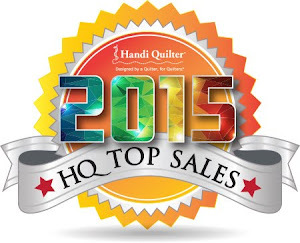 Hope Springs eternal with many more quilt shows. The other day I ran up to Lancaster to the AQS Quilt Show with a friend of mine and we had a wonderful time! The show's going on through Saturday, and if you're in the area and have the chance check it out...all I can say is wow! I have a bunch of goodies to unpack...it's not my fault ~ the vendors were fantastic :) and I'm still catching up from taking the day off, so I'll post more on Lancaster soon. 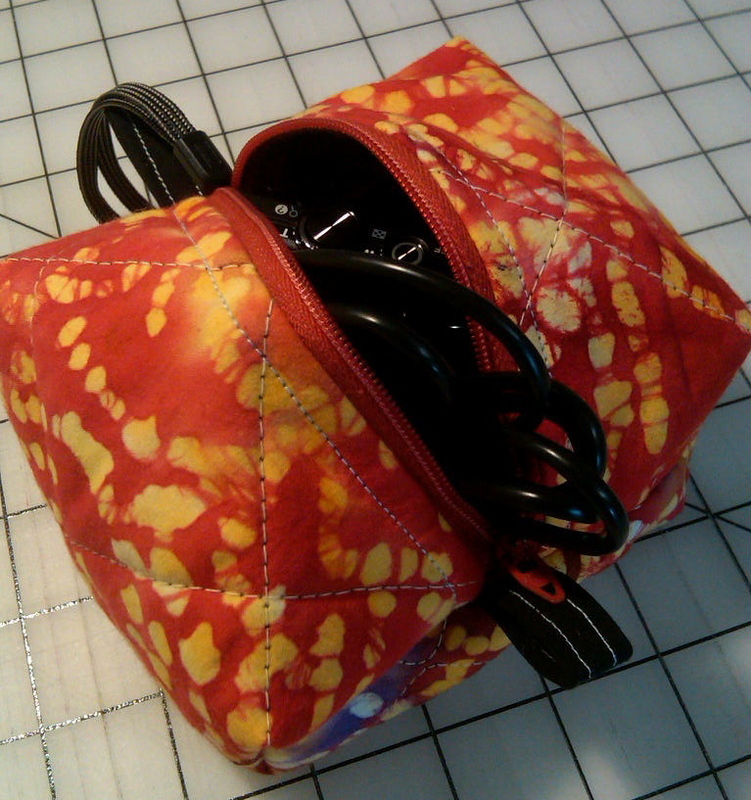 Ok, I did go "out of my box" for this week's Project Quilting entry. The criteria for this challenge was to use a traditional Flying Geese block as inspiration but to do something different with it. I wanted to try the curved Flying Geese that I've seen in some art quilts at shows, but I'd never made them before, so this attempt was completely different for me. And while I'm most comfortable with reproductions, home-spuns, and some brighter cottons, I rarely use batiks ~ which I used here to piece the background. I wanted the geese to curve and graduate in size, so I figured that paper piecing would be the way to go with this. I drew out my curves and drafted the geese in a larger "life size" form, and then traced the geese unit in four sections to make them easier to handle. 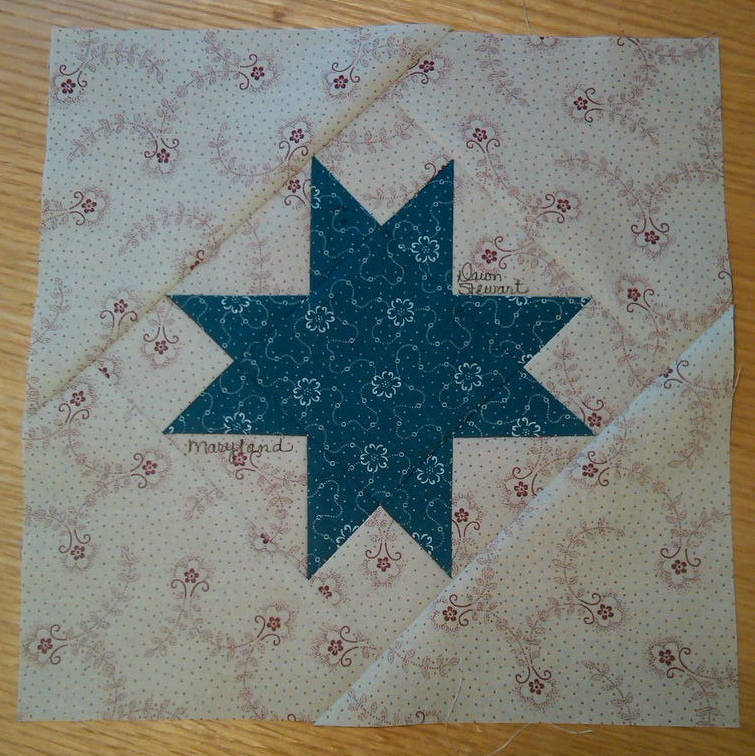 Then I paper pieced the geese, and sewed the units together. Since my first love is hand applique, that's how I decided to attach my geese to my background. I basted under the edges, appliqued it in place, and then cut away the background from behind and removed the paper backing from the geese. The other criteria of the challenge was to use two complimentary colors on the color wheel in our piece. I used 13 different shades of blue and orange to compose the flying geese, graduating the shades from dark to light to dark again. Blue and orange because my inspiration for the project are the geese that converged on my daughter's college campus every year at Gettysburg College ~ and blue and orange are Gettysburg school colors. After quilting, I stretched and mounted the quilt over a 16" x 20" artist canvas. 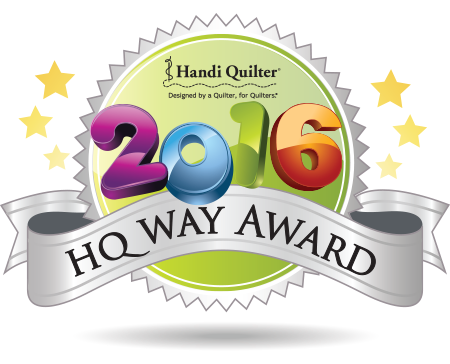 The voting is up now for this week's Project Quilting challenge and you can go here to cast your vote for your favorite entry. It's really cool to see what everyone comes up with, and to read what their inspirations were. Don't forget to leave a comment to be entered in the give away too! This is the closet of my Sewing Room Annex/Design Studio (aka Heather's old bedroom). I usually leave the door of this walk-in closet closed because it usually looks like a tornado has gone through it. The closet is definitely furnished on the cheap. This unit was built out of plywood to hold paper and supplies in an old office closet, now it's holding scrap booking papers and supplies pretty effectively. I can actually get to my fabrics now (there used to be piles on the floor in front of these book case units). And No, this is not all of my fabric stash. I have to admit, I do have another closet full of yardage in my original Sewing Room next door. ...and more piles used to be in front of this bookcase where I'm now keeping works in progress and current projects that I'm gathering. It's not really attractive, or anything special, but now it's organized and functional, and all I can say when I look in the closet now is, "Ahhh!". As soon as I move some things around and make a few adjustments, I'm going back for this piece. I have the perfect place for it in my sewing room annex (aka Heather's old bedroom). And this cool bed frame is going to be a new addition to my guest room (aka Lisa's old bedroom). ...Much to Bobby's chagrin, I'm also making plans on what will one day be known as Bobby's old bedroom! ...Ikea has fabric too, and of course some of this had to come home with me! This is heavy upholstery weight fabric and will make some great cushions. I was also surprised to find that Ikea carries thread. I bought some to try out and see if I like it...I'll keep you posted on that. Yesterday I had a fun afternoon (after a not-so-fun morning at the dentist) hanging out spending some much needed time with my sewing buddies. After mentioning to my friend Mary that I'd like to learn how she puts zippers into her little bags and pouches that she makes, she commenced to show us with an impromptu demo. Starlyn (who was hosting our little sewing day), pulled out some squares of pre-quilted fabrics, and a drawer full of various zippers from her amazing stash, and in minutes Mary had us making these cute little bags. 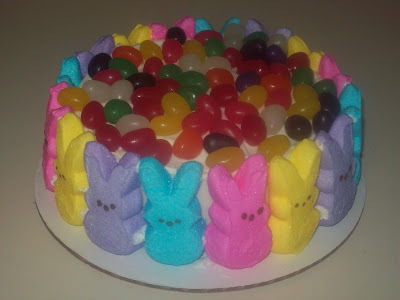 By the way, today is Shrove Tuesday, Lent starts tomorrow, and that means Easter is on it's way! With Easter comes Peeps ~ both Peeps Bunnies and Peeps Chicks! Anyway, for anyone who is a Peeps fan, the 5th Annual Peeps Diorama Contest sponsored by The Washington Post is underway (contest submissions are due by March 14th). You can find out about this fun and creative contest here, and see pictures of past contest winners...I guarantee a few chuckles! I love this bright and happy quilt, so it's been a pleasure to make another one. I think I'm going to cut out a couple more and make a few to sell in the Etsy shop. 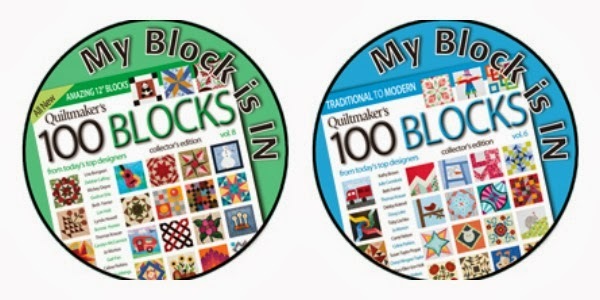 Keep watching, we may have to have a little fun with National Quilting Day coming up soon! This is my newest finish. I'm so excited ~ today I boxed her up and shipped her off to be photographed. I'm a little apprehensive too, It's always hard to trust the Post Office and send my babies out into the world. I can only give you a little sneak peek right now. She's being photographed to make her debut in Quilt Magazine, I think the August/September issue. Don't you just love these fabrics? It's Anneke's Collection designed by Jennifer Chiaverini for Red Rooster Fabrics...due to be in quilt shops (and my web store) later this month!